It's Day One of the Embedded Systems Conference. This time, instead of Embedded Systems Conference East, this is being called Embedded Systems Conference Spring (you can't really call Chicago the East, now, can you? In the past, exhibitors have tried various themes to attract people to their booths. Hitachi had runway models in San Jose last year - yep, blatant booth babes that people were still talking about today. Keil Software two years ago had a biker bar, complete with two Harley-Davidsons and beer. At the same show Microsoft gave away a Corvette and Tasking had a pretty impressive magic show. ESC Spring is more of a return to basics. A successful technique that is getting more popular is Educating the Engineers. More and more exhibitors are putting on sophisticated presentations teaching the attendees about their products and the technologies involved. QNX, i-Logix, Emultek, Applied Microsystems, Green Hills, and many others had well-attended classes on the show room floor that taught about RTOS, debugging, and various other concepts. Microsoft had a catchy, descriptive name for their presentation - "Microsoft Technical Theater". So, between the free pens and the rap dancers at Integrated Chipware, I got a chance to experience the wares of some of the exhibitors. Intel gave a confusing message by sponsoring a well-received dinner media event on Monday night for the tools vendors, yet they did not have a booth at the show. Intel, remember, gave us the venerable 8051, a microcontroller whose demise has been predicted for the past ten years but is so well supported that it will continue to be the most popular 8-bit microcontroller architecture for probably the next hundred years. Intel is now seeking tools partners for the StrongARM™ architecture. Intel's plans for StrongARM™ may produce a revolutionary change in the marketplace for integrated high-end processors for handheld and multimedia applications. Remember when Intel thought DSP was a dirty word? Did you read about the new 16-bit DSP architecture Intel is developing jointly with Analog Devices? The combination of Analog Devices' knowledge of customer's DSP needs and Intel's market presence and relationships with development tools vendors (face it, Analog Devices' 16-bit development tools are so poor they're unusable) can cause a significant change in the embedded DSP marketplace. Highly respected embedded compiler manufacturers Keil Software and Tasking Inc. demo'ed new versions of their IDEs. Keil's new µVision 2 IDE environment has some of the ease-of-use features found in Microsoft's Visual Studio, while Tasking's Embedded Development Environment contains additional optimizations to provide more flexibility to the sophisticated C/C++ programer. Siemens Microelectronics once again demonstrated their strong 3rd party tool vendor relationships by sponsoring separate kiosks at their booth for demos of all of their major tools partners. This has always been popular with attendees at ESC. One of Siemens' greatest strengths is their close working realtionships with their 3rd party tool manufactuers and their successful efforts to maintain their quality of tools. 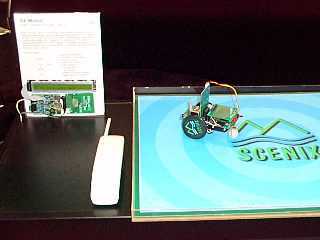 Scenix Semiconductor, whose Microchip-compatible devices now span over 15 derivatives, had a cool robotics demo (seen to the left) and also now boasts new additions to their Virtual Peripherals library such as a 12000bps FSK modem, direct-drive LCD peripheral, DTMF generation, and the only on-chip DTMF detection (virtual) peripheral I've seen in a micro. According to Scenix's Application Manager Abdul Aleaf, the DTMF detection Virtual Peripheral will soon receive Bell certification. Abdul recently came to Scenix after over ten years of directing applications efforts for microcontrollers at National Semiconductor. Also joining Scenix from National is Bulent Celebi. Former Microcontroller Director at National, Bulent is Scenix's new CEO, and is very excited about promoting the industry's first 100MIP 8-bit microcontroller. 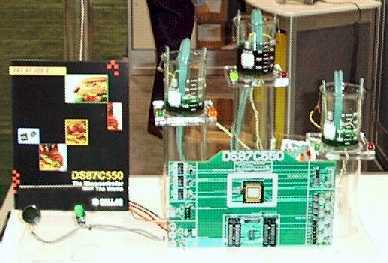 Dallas Semiconductor repeated their cool demo of the DS87C550, their fast 8051-derivative microcontroller with 8K bytes EPROM and a 10-bit A/D converter. The A/D sensed fluid levels as it pumped an unknown green liquid (resembling the fluid used by barbers to clean combs) from one beaker to another. Motorola, Siemens, and Mitsubishi all had product for Automotive applications, ranging from engine control to power windows. Hitex Development Tools, who manufactures a wide selection of in-circuit emulators, is continuing their aggressive promotion of CAN networking and tools by offering free classes and demos. In all, I got a good flavor of the first day. I finished up by visiting Chicago's Pane Caldo Restorante Italiano ("Pane Caldo" means hot bread in Italian) with some friends for one of the best Italian meals I have ever had - I give it five stars *****!